I know, I know, when it comes to jazz and Harlem, the phrase "A Great Day in Harlem" has become as cliche as it comes. But I can't deny it: last Saturday, January 7, WAS a great day in Harlem....or more specifically, the National Jazz Museum in Harlem. For four hours (not a typo), I moderated a panel that consisted of David Ostwald, Dan Morgenstern and George Avakian. Seriously. I'm sorry if my gushing gets tiring, but a few years ago, I would have quit my job to just be at something like this (and I would have been too bashful to open my mouth). To be moderating it? There are no words except pure gratefulness. 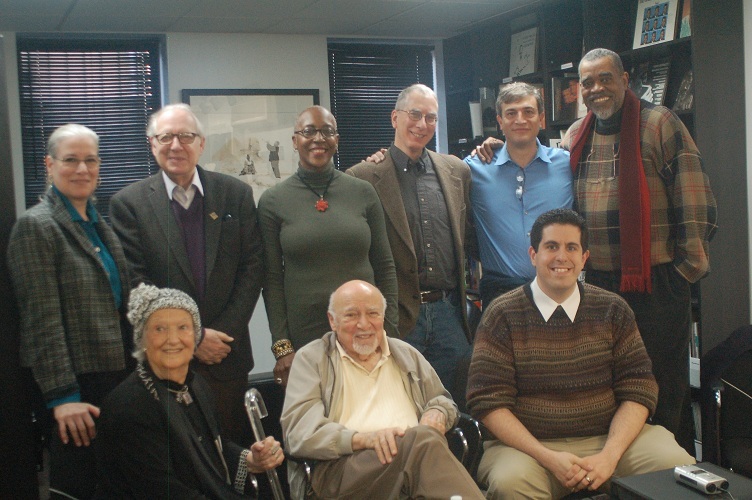 For those keeping score at home: (Top row, L to R) Gwen DeLuca, Dan Morgenstern, Jackie Harris, Michael Cogswell, David Ostwald, Ray Carmen (Bottom row, L to R) Phoebe Jacobs, George Avakian and your truly. When I told Michael Cogswell who was on the panel, he joked that he felt uncomfortable, bringing up how the President and Vice President never ride together in the same car. "If someone were to blow up the building," he said, "it would set Armstrong scholarship back 40 years!" I could keep going on and on about the proceedings but I won't and for a very good reason: you can hear it for yourself. Yes, not only is the National Jazz Museum in Harlem is a beautiful place for simply putting on these type of programs almost nightly, but they do an excellent job of recording them and posting the audio on their website. So here it is, broken into 4 parts ranging from 44 minutes to 57 minutes: Louis Armstrong Panel Audio. What will you find if you choose to devote 3 1/2 hours of your life to listening to it? Plenty. I had my trusty iPod in my hand at all times so when Dan Morgenstern talked about certain moments of the Slivovice interview, I had them cued up or when George Avakian talked about "Louis Armstrong Plays W. C. Handy," I had specific outtakes ready to play (and yes, the same outtakes and unissued alternates that I wrote about in my book, the ones I couldn't share on the blog but with George, who gave me the permission to copy them for my research, sitting next time, how could I not!?). And pay attention to David Ostwald, too. Many know him simply as the tuba player with the vaudevillian lines who leads the Louis Armstrong Centennial Band at Birdland every Wednesday at 5:30. But I've gotten very close with David over the years and I've talked enough Pops with him to know that he has some tremendous insights into the man. He did not disappoint on the panel (and some thought he stole the show with his answer about Louis as a civil rights pioneer in the first part....don't miss it). Once again, thanks to Loren Schoenberg and the National Jazz Museum in Harlem for making this stuff happen and extra special thanks to my esteemed guests and esteemed audience who made it such a special day. And for those in the NY area, don't forget that I'll be giving three more lectures on Louis at the Museum on Tuesday the 17th, 24th and 31st, each one beginning at 7 p.m. Enough from me...happy listening! Followed the link and started to listen. Then I heard "Lou-iss" repeatedly which soured me. LOUIS is pronounced "Lou-ee" since it's actually a French name, and Satch even insisted on having his name spelled "Louie" on some recordings so folks would get it right. You doubtless know that "Satchmo" came from some European MC's attempt to pronounce "Satchelmouth." I'm a 69-year-old Louis, myself (of Italian ancestry), and I think your blog is a great tribute to one of America's greatest jazzmen. Hi Lou and thanks for the kind words about the blog! There's really no wrong answer when it comes to the "Louis" vs. "Louie" debate since he's been called it both ways but I truly believe that Louis preferred the "Lou-iss" pronunciation. When he recorded "Hello, Dolly," the session's producer suggested Louis sing, "It's Louie, Dolly," but Louis responded, "It's Louis!" with the "s" sound and that's how he sung it on that hit record, holding the "s" for extra emphasis. I've listened to dozens, maybe hundreds of tapes of Louis and he always, 100% of the time, referred to himself as Louis with the "s" sound. Even when he filled out his draft registration card in 1917, the clerk wrote down his name as "Lewis Armstrong" because that's obviously how Louis pronounced it. Yes, "Louis" does have a French connotation but as Lucille Armstrong once pointed out, Louis didn't pronounce his name that way because "Louis wasn't French." Obviously, there's nothing wrong with calling him Louie; many friends called him that, including his wife Lucille, and there are the records "Laughin' Louie" and "Louie's Dream." But if you ask me what I think Louis preferred, I'd argue that it was the "Loui-iss" pronunciation. So let's agree to disagree....and agree that by any name, Pops/Satchmo/Dippermouth/Louis/Louie was the best! First, as always, GREAT blog, and congrats on the amazing experience, Ricky. This has come up when discussing my book, Live Like Louis (now written and being edited, by the way). I have taken to pronouncing him Louie when telling people about the book or discussing Pops. If I pronounce it "Live Like Lewis," it is immediately offputting, and the first thing the person will say is he or she thought his name was pronounced differently. I don't want to get sidetracked or immediately put a wedge between me and an audience. But amongst people in the know (all none of them here in Upper Michigan!) it's Lewisss. Hopefully someday I'll present to an audience who requires I pronounce it Pops' way! Red beans and ricely yours. I love how you have risen to the level of interacting with such lumanairies and yet still fully aware of the honor. I always enjoy your blog. Keep it up.